With the ongoing turmoil in the world, specifically in the Middle East, we are being exposed to how the world situation is affecting our daily lives. One area of our lives that is being affected is the fluctuation of gas prices. Many people just blindly state that a war in the Middle East increases the price of gasoline. It takes an inquiring mind to take it one step further and explain if and how it is affecting prices. Is there some type of relationship or explanation of how gasoline prices are affected by issues in the world or is gasoline no different than other commodities? 1. How much have the gas prices changed? How fast are they increasing? 2. How were the gas prices affected during the first gulf war? 3. Based on the post effects of the first gulf war on gas prices, can you predict what will happen after this current war? 4. Outside of the war can you identify any other trends related with gas prices? 5. Based on your findings, what will happen to gas prices in the next 10, 20 and 30 years from now? What are the mean, median, & mode of gasoline prices for a fixed amount of time (ex. 10, 20, 30 years)? Are the same trends found for the different grades of gasoline? Gasoline prices for consecutive amounts of time. Defining Trend Line: a graphical representation of a statistical trend or pattern. For example, if time spent studying increases, grades will also increase. Therefore, the slope will be positive. Students will be using numerical data, spreadsheets, Excel tools, and mathematical thought processs. They will be able to use these items to calculate trend lines & their corresponding equations. Data will be placed in a spreadsheet so that students will be able to manipulate it for their exploration. Students can use tools in Excel to make graphs, find trend lines, equations for the trend lines, etc. Students can use all these tools to analyze the data. This website contains numerical data as well as a graph representing the gasoline prices from 1979 to present. The students will have to transfer the data into a spreadsheet and create their own graphs to be able to analyze them in furter detail. How much have the gas prices changed? How fast are they increasing? where x represents days (based on graph #4 and trend line equation). where x represents days (based on graph #6 and trend line equation). How were the gas prices affected during the first gulf war? 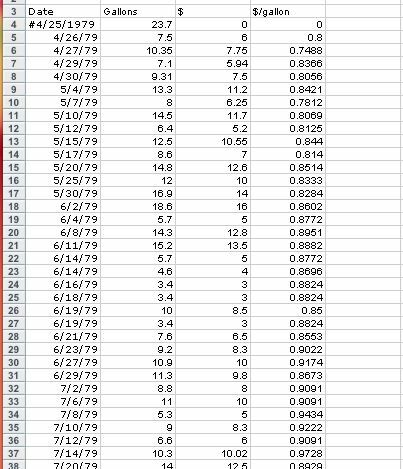 Looking at a couple of months when prices were increasing during the 1st war we see that gas prices were increasing approximately at the rate of 0.39 of a cent each day (based on graph #9 and trend line equation). Looking at a couple of months after the peak of the prices during the 1st war we see that gas prices were decreasing approximately at a rate of 0.42 cents a day (based on graph #11 and trend line equation). Based on the post effects of the first gulf war on gas prices, can you predict what will happen after this current war? Looking at the data during the 1st war it was apparent that the gas prices decreased at a faster rate than the rate at which it increased during the war. I assume the same trend will be seen during the current war. Looking at a couple of months when prices were increasing during the current war we see that gas prices were increasing approximately at the rate of 0.28 of a cent each day (based on graph #14 and trend line equation). So I assume that the rate at which it will decrease after it has reached its peak will be greater than 0.28 of a cent each day. We can already see that trend in very limited data that we have recorded. 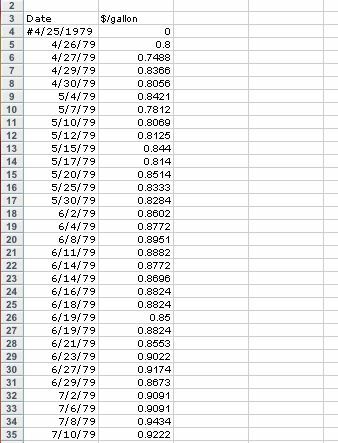 Looking at graph #18, covering a two-day time frame gas prices approximately dropped at a rate of 6.5 cents each day, which is greater than the 0.28 of a cent it was increasing per day. Represents the trend of the graph, which still is decreasing at a faster rate than the 0.28 of a cent per day rate at which gas prices were increasing before they peaked during our current war. Outside of the war can you identify any other trends related with gas prices? I notice that even though the gas prices seem to fluctuate between highs and lows due to different influences, in the overall picture it does seem to be increasing with time. I think that is a direct positive relationship to inflation. Other factors that may affect the gas prices are economy, supply, world issues (war), etc. 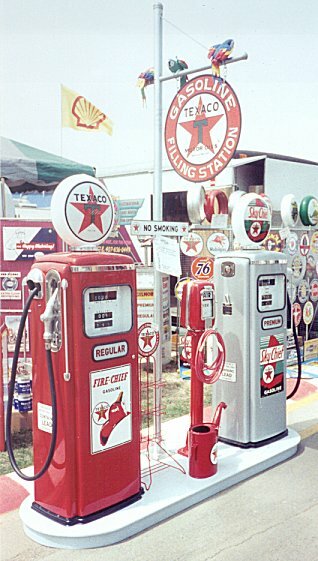 There are many factors that have an influence on the gas prices. Based on your findings, what will happen to gas prices in the next 10, 20 and 30 years from now? They will continue to fluctuate with highs and lows, but overall they will be following an increasing pattern. To predict the possible prices in 10, 20, or 30 years we can use either one of the two sets of equations listed in the first question to approximate a price. I think it would be easier to se the linear equations! The data above represented gas prices in Texas, do you think gas prices in other parts of the nation will follow the same trends reflected above? The data above represented gas prices in an U,S, city, what possible trends do you think will be represented in different parts of the world? Based on the trends above, how will it influence your budget?